There are a variety of spreads, or layouts, that can be used in reading Tarot cards. Try one of these–or try them all!–to see which method is the most accurate for you. Be sure to start off by reading up on how to prepare for your reading - it's going to make things a lot easier for you! The spreads in this article are listed in order from easiest to most complex - if you've never read before, for yourself or anyone else, start at the top with a simple three-card layout, and work your way down the list. As you familiarize yourself with the cards and their meanings, it will become a lot easier to try more complicated layouts. Also, you may find that you get more accurate results with one spread over the others. That happens a lot, so don't be alarmed. So you've got your Tarot deck, you've figured out how to keep it safe from negativity, and now you're ready to read for someone else. Perhaps it's a friend who's heard about your interest in Tarot. Maybe it's a coven sister in need of guidance. Perhaps–and this happens a lot–it's a friend of a friend, who has a problem and would like to see "what the future holds." Regardless, there are a few things you should do before you take on the responsibility of reading cards for another person. Be sure to read this article before you do a reading! Use just three cards for a simple reading. If you want to brush up on your Tarot skills, do a reading in a hurry, or just get an answer to a very basic issue, try using this simple and basic Three Card Layout for your Tarot cards. It’s the simplest of readings, and allows you to do a basic reading in just three steps. You can use this quick method to do readings for friends and family as you brush up on your skills, or you can use it for any Querent who needs an answer in a hurry. The three cards represent the past, the present and the future. Lay out seven cards to form an open horseshoe. 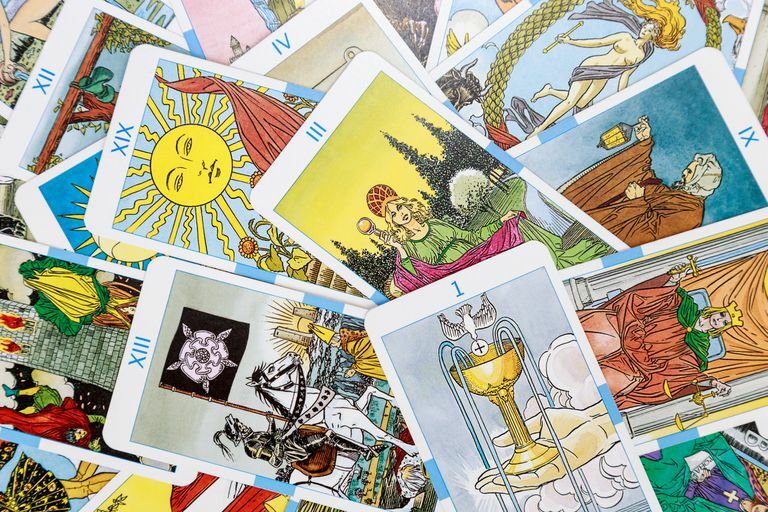 As you develop your Tarot reading skills, you may find that you prefer one particular spread over the others. One of the most popular spreads in use today is the Seven Card Horseshoe spread. Although it utilizes seven different cards, it’s actually a fairly basic spread. Each card is positioned in a way that connects to different aspects of the problem or situation at hand. In this version of the Seven Card Horseshoe spread, in order, the cards represent the past, the present, hidden influences, the Querent, attitudes of others, what should the querent do about the situation and the likely outcome. Use the five-card pent spread to get a deeper reading. The pentagram is a five-pointed star sacred to many Pagans and Wiccans, and within this magical symbol you'll find a number of different meanings. Think about the very concept of a star. It is a source of light, blazing in the darkness. It is something physically very far away from us, and yet how many of us have wished upon one when we saw it up in the sky? The star itself is magical. Within the pentagram, each of the five points has a meaning. They symbolize the four classical elements–Earth, Air, Fire and Water–as well as Spirit, which is sometimes referred to as the fifth element. Each of these aspects is incorporated into this Tarot card layout. Lay out the cards in the order shown. The Romany Tarot spread is a simple one, and yet it reveals a surprising amount of information. This is a good spread to use if you are just looking for a general overview of a situation, or if you have several different interconnected issues that you're trying to resolve. This is a fairly free-form spread, which leaves a lot of room for flexibility in your interpretations. Some people interpret the Romany spread as simply past, present, and future, using the cards together in each of the three rows. The more distant past is indicated in Row A; the second row of seven, Row B, indicates issues that are presently going on with the Querent. The bottom row, Row C, uses seven more cards to indicate what is likely to take place in the person's life, if all continues along the present path. It's easy to read the Romany spread by looking simply at the past, present and future. However, you can go into more depth and get a more complex understanding of the situation if you break it down into its different aspects. Lay your cards out as shown in the diagram to use the Celtic Cross spread. The Tarot layout known as the Celtic Cross is one of the most detailed and complex spreads used. It's a good one to use when you have a specific question that needs to be answered, because it takes you, step by step, through all the different aspects of the situation. Basically, it deals with one issue at a time, and by the end of the reading, when you reach that final card, you should have gotten through all the many facets of the problem at hand.